Bally Walk-In Coolers and Freezers are uniquely designed to save you time and money when you build, and to keep operating costs down for years to come. Simplicity of design assures ease of assembly, and allows for future Walk-In Cooler and Freezer expansion or relocation. A Bally Walk-In Cooler or Freezer's durable, pre-engineered panels reduce construction costs and provide superior durability. The panels of a Bally Walk-In Cooler or Freezer are made of poured-in-place, non-ozone depleting urethane, which has double the insulating efficiency of fiberglass or polystyrene, and keeps energy costs to a minimum. The lightweight Bally panels are available in 4", 5", and 6" thickness. Bally's Speed-Lok joining mechanism forms a tight, secure joint, holding warm air out and cold air in. Speed-Loks join all panels: wall to wall, ceiling to wall, and floor to wall to create a complete vapor barrier system. 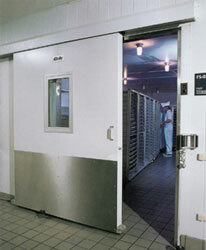 Speed-Loks also provide easy assembly or disassembly for Walk-In expansion or relocation. We design each and very Bally Walk-In Cooler or Freezer to meet your specific needs. Standard panel sizes and packaged refrigeration systems are offered as part of our Standard Walk-In Cooler and Freezer Quick Ship program, while custom sizes and offerings allow you to create any Walk-In Cooler or Freezer you desire. Contact Thermal Control today at 413-568-0690 for all of your Westfield, MA refrigeration service needs. Content copyright 2010-2012. Thermal Control. All rights reserved.